It seems to be quite a trend these days to transition a popular tv show to the stage - Acorn Antiques - the Musical, Yes, Prime Minister, The Addams Family and even The Jerry Springer Show with Jerry Springer - The Opera. The most recent offering is Fat Friends - The Musical, based on the popular tv series, Fat Friends, from 2000, written by the award winning Kay Mellor. It ran for five years on ITV, and starred Alison Steadman, Gaynor Faye and Lisa Riley; launching the careers of James Corden and Ruth Jones. 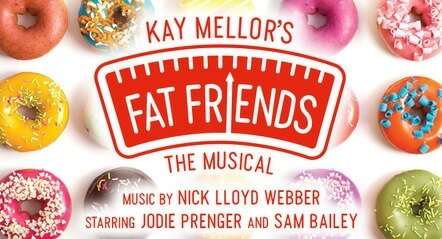 Confessing that she had been longing to write a musical for some time, Fat Friends - the Musical has been written and directed by Kay Mellor with composer, Nick Lloyd Webber, adding the music to Mellor's lyrics. The show re-introduces the characters of Kelly, Kevin, Betty, Fergus, Lauren, Val, Paul and Alan and the branch of Super Slimmers weight loss club based in Headingley, Leeds, which is actually where Mellor lives. The ongoing universal themes of love, loss, jealousy, family and naturally, body image are highlighted in the show with the focus centering on the overweight Kelly, her forthcoming nuptials and the anticipation of whether she will be able to fit into the wedding dress of her dreams. There is also the underlying story of lovelorn Lauren, longing to meet her 'Mr Someone' who just happens to be right under her nose in the guise of local vicar and fellow Zumba instructor, Paul; and the protagonist of the piece, Julia Fleshman, the self inflated head of the slimming club franchise who has ulterior motives for the club's success. Kelly is beautifully played by Jodie Prenger, who puts her heart and soul into the role and also gets the opportunity to show off her fabulous vocals starting off with Be My Man and especially in Beautiful. Unfortunately, Sam Bailey, was too ill to perform on the opening night at Southend as I understand that she has a really bad flu virus. Taking over her role was Ellie Leah, who put in a great performance as Kelly's mother, Betty. Kevin Kennedy, who most will remember as Curly from Coronation Street, plays Kelly's dad, Fergus, and surprisingly impresses with some strong vocals. I loved watching the relationship developing between Lauren and Paul played by Natalie Anderson and Jonathan Halliwell and also enjoyed their duets, Mr Someone and Fun Boy. Lauren has a fabulous singing voice which may come as a surprise to those who have maybe only seen her on tv in Emmerdale and The Royal and I enjoyed her sing-songy portrayal of the rather inhibited girl yearning to break free from her repressive family. Natasha Hamilton certainly shows that she has what it takes to play the villain of the piece, Julia Fleshman in a nicely played part. The staging for this show is vaguely reminiscent of the Acorn Antiques Musical with its staging incorporating a row of shops facade with a wedding shop, pizzeria, cake shop, the fish and chip shop which Kelly's parents own and the church with its hall where the slimming club is held. There's lots of fun as well as pathos in this show with the audience lapping up every humorous moment. Anyone who has ever been to a slimming club will easily be able to relate to the goings on in this production - who hasn't worn the lightest of clothing and taken off practically every item of jewellery and shoes before getting weighed, not to mention having one last visit to the loo?! The are a few no holds barred moments in the show with a little bit of fruity language which for some reason I wasn't expecting. This said, one of the biggest laughs comes from the Chocolate (is my lover) number where the girls, aided by the boys in Full Monty type regalia, fantasise about a giant bar of chocolate - I won't be able to eat a Cadbury's Flake again without thinking about that one! There are some nice musical numbers in the show with styles ranging from pop, disco, latin and a nice soft rock type power ballad in The Only Fool is Me, sung by Joel Montague as Kevin. For me this is a show of two halves with Act 2 definitely picking up the pace. There's a lot of fun to be had and of course a moral to the story which delivers the message that we naturally come in all shapes and sizes, should accept who we are and be happy in our own skin, as the final number of the show endorses with, Love Who You Are. This is a heart warming, feel good show that will create huge appeal and empowerment to anyone who has ever had to count calories. Don't tell Rosemary Conley, but 'Diets are Crap' just 'Love Who You Are' - you can buy the t-shirts to prove it! ​If you can't 'weight' to see the show you can still grab tickets at the Cliffs Pavilion. Click the link below.